9/2/2008Share this story on Facebook! 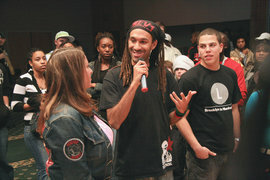 Hip-hop activist and author J-Love talks to students during "The Essence of Hip-Hop," a free event presented by IC's African-Latino Society. Looking for a cheap thrill? ... or have fun on campus! Want more? Check out the weekly event listings in the Ithaca Times! 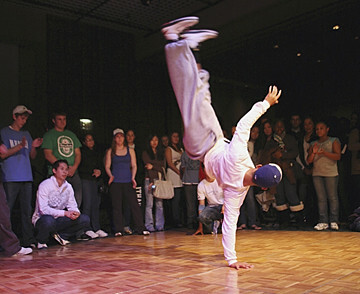 Even students who love hard work need time to relieve stress, wind down after classes, and let loose on the weekends. Whether your idea of fun is going for a hike, visiting a museum, listening to some good music, or enjoying a little retail therapy, there’s something for everyone -- and your piggy bank will love you! Here are 10 ways IC students kick back without spending more than $10. There are plenty of ways to play without paying. Grab your friends and cheer on the Bombers—IC students get in free at all regular-season sporting events. The Campus Center rec room offers billiards, ping-pong, and other games to entertain you on a Saturday night or when you’re killing time between classes. 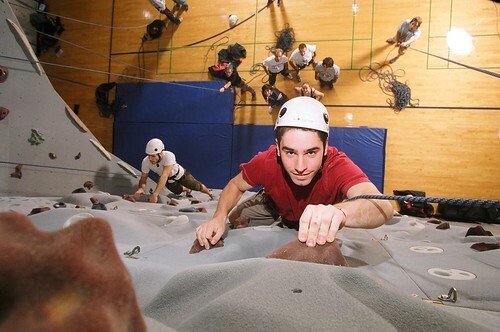 Test your strength at IC’s climbing wall for only $5 per session. Or go skating at Cass Park for $4 plus a $3 skate rental fee (if you get a free Ithaca Youth Bureau rec card). Feel like climbing the walls? Go ahead! It's just $5 with an Ithaca I.D. From musical to drama, comedy to opera, Ithaca’s Department of Theatre Arts puts on eight main-stage shows a year with tickets as cheap as $8. Or take in a show from IC Triple Threat for only $5. Stop at the Handwerker Gallery, where you can watch screenings of student films, peruse art and photo galleries, and listen to student and faculty readings -- all free! IC Square in the Campus Center hosts tons of free events during the week. Come be the judge at Ithaca Idol (a karaoke night similar to American Idol), speak out at an open mic night sponsored by Spit That (a slam poetry club), or get your groove on with a performance from IC Breakers (a break dancing club). The Student Activities Board regularly sponsors free events featuring comedians, hypnotists, ventriloquists, and improv comics. In the past, IC has hosted Bill Burr from Chappelle’s Show and Robert Kelly, who’s toured with Dane Cook. 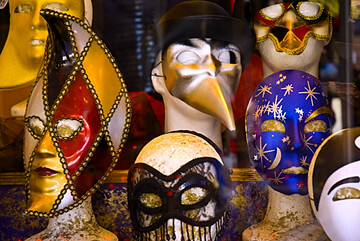 Or enjoy a show by the IC Comedy Club, which performs nearly a dozen free shows per year. 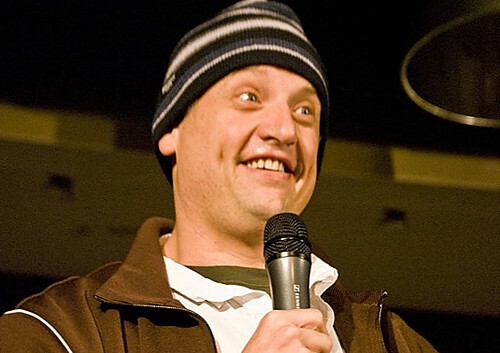 Comic Eddie Gosling hams it up while performing at Ithaca College. See a recent blockbuster for $3 in Textor Hall, a lecture hall that converts nicely into a big-screen, stadium-style movie theater at night. Or check out the Park School’s frequent screenings of student films and documentaries. In town, Cinemapolis and Fall Creek Pictures show independent films for as little as $6.50 on weeknights and $8.50 on the weekends. 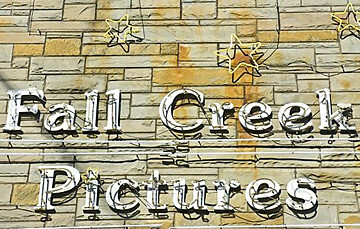 Fall Creek Pictures and Cinemapolis offer discounts to Ithaca College students. The School of Music hosts over 300 performances a year, sometimes eight performances in one day! Most student and faculty performances are free, including ensembles, junior recitals, and senior concerts. Concert series performances by renowned musicians are $11 for IC students, but dozens of stellar visiting musicians can be heard for free each year. And don’t forget about the free concerts put on by our awesome a cappella groups: Voicestream, Premium Blend, and Ithacappella. 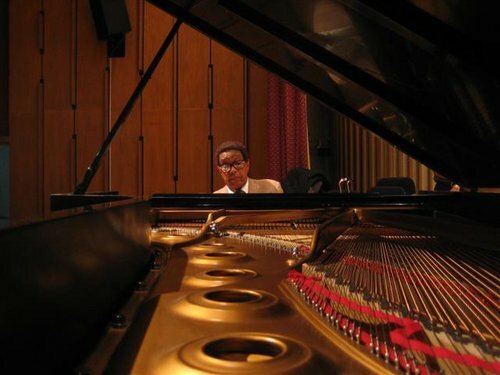 The renowned jazz pianist, Bill Taylor, is just one of the many distinguished musicians who have performed at IC. IC hosts lots of free on-campus lecturers -- but don’t yawn just yet. There’s something exciting and intriguing every week, from Pulitzer Prize-winning writers, world-renowned journalists, Nobel laureate scientists, Grammy-winning musicians, accomplished alumni, and IC’s expert faculty. In the past two years, the College has welcomed the Dalai Lama, journalist Bob Woodward, author Scott Russell Sanders, documentary filmmaker Rory Kennedy, and Walt Disney Company president and CEO (and IC alumnus) Bob Iger ’73 -- to name a few. 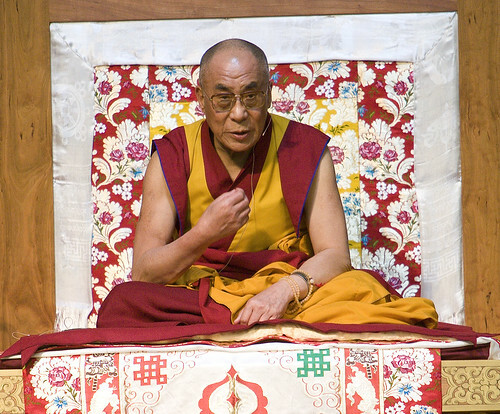 Recent visitors to Ithaca College include His Holiness the Dalai Lama. You can’t call yourself a true Ithacan until you’ve visited the famous Ithaca gorges! Appreciate Ithaca’s natural beauty by hiking or walking through the dozens of trails and state parks close by (some have a small admission or parking fee). A favorite among students is Buttermilk Falls State Park, which has a steep hiking trail that rewards your effort with a view of 10 waterfalls. You’ll also find recreational trails for hiking and cross-country skiing right on campus! You can even rent gear for a small fee from the Outdoor Recreation Equipment Center located in the Fitness Center. 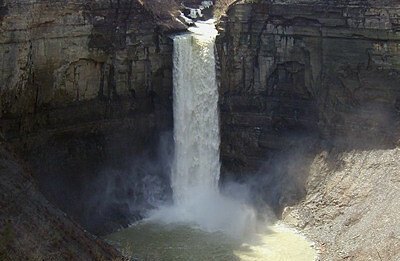 At 215 feet, nearby Taughannock Falls is one of the highest falls east of the Rocky Mountains. It doesn’t cost a thing to browse through the one-of-a-kind shops on the Ithaca Commons, like Evolution 102, which is known for its racks of retro offerings, or Trader K’s for cheap clothes. Then kick back in one of many funky coffee shops, like the Lost Dog Café, which has $8 lunch combos, $6 appetizers, and live music during the week with a cover charge between $5 and $10. Evolution 102 is just one of many fun and funky shops on the Commons. 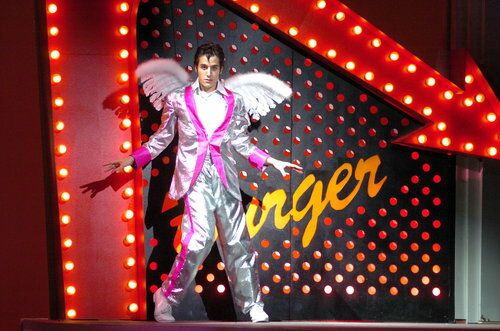 IC After Dark organizes free, themed parties every semester. Saddle up for urban cowboy night and take a ride on the mechanical bull, dance the night away at the cosmic revolution party, bring your game face to the Super Bowl party, or try your luck at the dating game and casino night. It’s tons of free food and tons of fun. 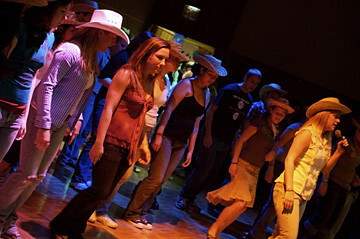 An annual IC event, Urban Cowboy Night gets everyone dancing.